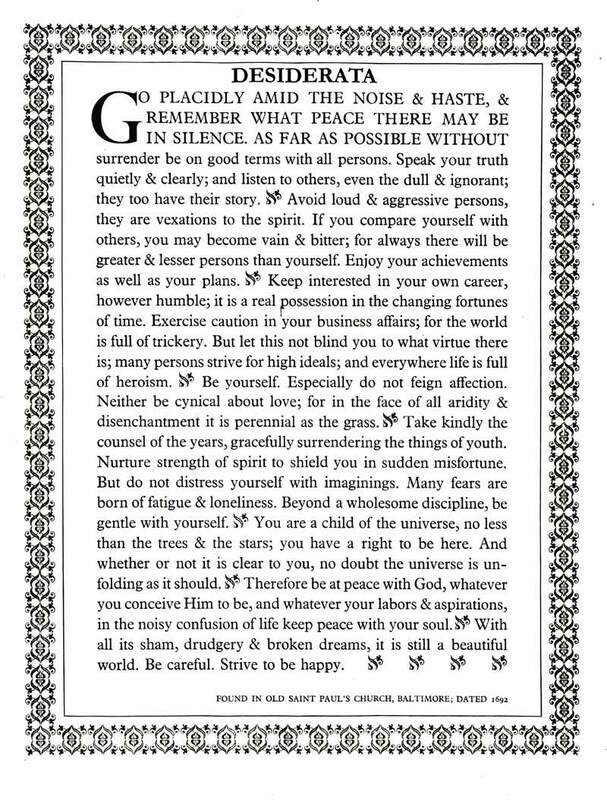 No matter how many times I read the Desiderata I never tire of it. It has such relevance, even today (especially today - our modern world would do well to just. slow. down). Wikipedia has some pretty interesting things to say about its history (mistaken and actual). Its words have such power. They slow my heart-rate in a relaxing way and all my muscles untense. My brain changes into a lower gear and my mindset shifts. Lovely. A daily read I think, would be medicine for my head. Update: I recently came across this book which goes through the Desiderata line by line, and expands on their meaning so that we may more easily apply the wisdom to our daily life. What I've read in the sample I love, and I instantly felt myself relaxing as I read. This book is going on my wish list for sure! Beautiful. I have never heard of "Desiderata". Thank you for sharing it with us. I especially like the part about loud, aggressive people being vexing to the spirit. Like your classmate in yoga, yes? Have a wonderfully peaceful day. This is lovely. I have never heard of it either. Thanks for sharing it. I am with Adrienne and Stephanie, this is so beautiful. ".. loud, aggressive people being vexing to the spirit.." a lesson in the study of human nature! Why do we hear THEM? Love it!! Thank You! I had never read this before. I think I will have to print it out and read it daily, they are such good reminders. Merci for your comments Adrienne, Stephanie, Debra, Shauna, Kalee and Russian Chic. I almost didn't post the Desiderata as I thought everyone would have read it a million times before and thought 'oh, here's another blog with the Desiderata on it'. I'm glad I did as everyone has a time when they need to be soothed by its words. "...even the dull and ignorant, they too have their story." isn't that why we are all blogging?! i love this and have not read it in full in some time. thank you for posting it. ps ~ what did you think of the peace meditation? 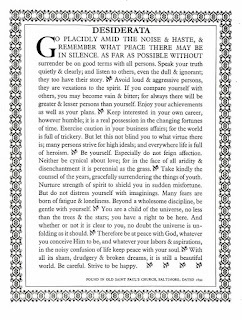 I adore Desiderata and keep a copy of it on my desk at work. I love "go placidly..." and I love the part about avoiding vexing people. And I love the part about my right to be here. And I love the part about.....Well, you get my point. Thank you so much for the reminder. If only we could all live by the Deserata. I wounder if it really was found in a old church or if that is an urban myth. My copy states that it was. Charming thought. Thank you! Janet, I love your sense of humour. I have listened to a small part of the peace meditation, thank you. Ideally I would listen to it at night going to sleep, but would have to someone put it on a disc to do that. I've looked into some guided meditations at the library to see if there are some I like. Thanks for opening my ears to this. Emily, I was thinking a printed copy at work in a folder somewhere that I could open up like smelling salts when the need arose. Wow, what wonderful apt words, I have never heard of it before now, so thank you for bringing it to our attention. I love the way it reads almost like a litany, very spiritual and thoughtful. Really lovely.